Had a wonderfully long day today… finished up the goodies for Stretch’s Halloween care package, and got a few moments in my herb garden to do some harvesting and general tidying up. Man, what I found there looked a little like Europe gone WRONG. 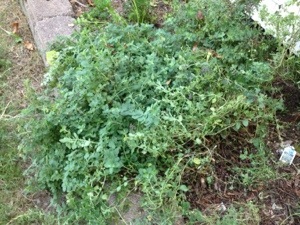 You see, I planted two kinds of oregano a few years back…Greek oregano and Italian oregano. I planted two very small plants of each. I planted one fairly decent sized rosemary plant, two thyme plants, two sage, two French tarragon, and some mint. Now yes, I also planted some tender herbs (like my sweet sweet basil) that don’t come back year after year, but the perennials I’ve already related to you. Now, last year the mint got yanked because it was taking over. I had mint EVERYWHERE. So I pulled it all out and left everything else. My herb garden is completely organic. I do NOTHING to it besides water, and a little hardwood mulch. That’s it. If I’m home, and can remember, I will weed it by hand, and I regularly make a trip outside with my shears to harvest something to throw on dinner. This summer I was busy, this fall I was even busier, and so my herbs had been left alone to fend for themselves. Well, Greece and Italy had basically overrun everything and were sharing that tramp, Rosemary. For real, my oregano was EVERYWHERE. It was lovely, but it was spilling over everything else and had managed to conquer my French tarragon (but I guess the French being conquered isn’t anything new…) and it also choked out my sage. Rosemary had gone from being a respectable size plant to being an evergreen I want to bedeck with white lights, red bows, and a star on top. YIKES. So I got in there today and ran Greece back to it’s borders. I pruned the sage back hard, and also shaped up the rosemary so that it wasn’t quite so unwieldy. I started working on the Italian plants, but the desire to see my football team play won out. I’ll finish the job sometime this week. So I’ve got a dehydrator full of basil and Italian oregano, which I plan to put into my homemade Italian seasoning. I also have my oven drying another good chunk of oregano and some rosemary. I’ve still a good bit to harvest before the frosts hit, so my friends, y’all can expect a good batch of herb salt for Christmas this year. And would SOMEONE please tell Rosemary that she doesn’t need to co-mingle with all of Greece and Italy? It’s very unseemly. 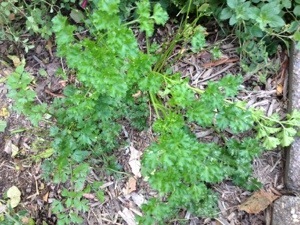 Oh, on another note, while taming some of the oregano, I noticed my parsley had decided to make a comeback. The heat got it very early on in the summer, but it’s decided it wants to live. I kinda like that. Maybe I should call that plant “Lazarus”. Back to work tomorrow, but photos of care package contents will be coming as soon as I get everything in the mail. I don’t want to spoil the surprise for Stretch. Night all! Anyone who knows me, knows that I HATE to waste food. I’ve had a challenge in my home for a while now with a refrigerator that freezes my produce. I’m not real sure what the heck is going on, either the door is being left slightly open, or someone is messing with the temperature on the outside of the fridge, or it’s just malfunctioning, but I am getting REALLY tired of buying beautiful fresh food only to have to throw it out when it’s ruined by my stupid fridge. Not all foods fall victim to ruination, of course. The strawberries (an unexpected find on my trip up to Frostburg) were hulled, rinsed, popped into FoodSaver bags and then into the big freezer. The cheese too, was not adversely affected by the unexpected deep freeze. However, the spinach and the arugula were another story. Luckily, only the top layer of leaves were frostbitten, however after getting rid of the damaged parts, I had greatly reduced amounts of each. And quite frankly, I was angry. So I got creative instead! I had to empty out the fridge anyway, so I pulled out the damaged greens, the frozen cheese (all hard varieties – two kinds of Parmesan as well as a bit of aged Gouda), I had roasted garlic too (that hadn’t been frozen) and I thought PESTO! Wait a second.. pesto is made with basil! Well yeah, and I had that too, out in the herb garden. So I broke out the food processor and went to work. The first thing I did was roughly chop up the cheese and put it in the processor. Pulsing, I ended up with these delicious little mixed crumbles. I dumped the cheese out onto a paper plate, and then added in the arugula. Again, pulse, pulse, pulse until the arugula was chopped up and it went into a bowl. 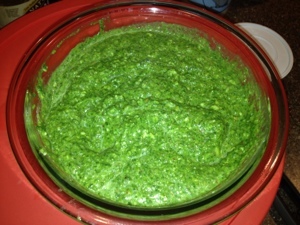 I repeated with the spinach, and added it to the arugula. Same deal with some basil I clipped out of my garden. I wish I could tell you what the measurements were exactly, but I maybe had 1.5 cups of arugula, 1.5 cups of basil leaves, and 3 cups of baby spinach. I put all the greens back into the bowl, and added in about 10 cloves of roasted garlic, along with about half a cup of the cheese crumbles. I didn’t have pine nuts, but I DID have almonds, and so a half cup of almonds also went into the processor. I turned the processor back on until the mixture got smooth and lovely. I drizzled in olive oil until it was creamy and smiled to myself about how clever I was to create something delicious out of near ruination. HOWEVER… when I tasted the finished product it was… bland. I mean REALLY REALLY bland. 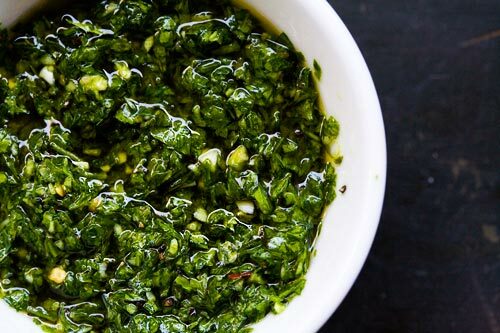 Almost boring, and pesto should never be boring. The first thing I noticed was that I couldn’t really taste garlic at all. The roasted garlic, I think was too sweet, too mellow… so I grabbed a head of raw garlic and added 6 cloves to the bowl. I also remarked that the sweet basil and spinach were almost TOO sweet. The bite from the arugula was getting lost. So I added a few red pepper flakes to give the sauce a little bit of zip. I also grabbed a lemon and squeezed the juice from half of it into the bowl. Re-processing, I sprinkled in a bit of Kosher salt, made sure everything was well mixed, and then tasted the finished product. This turned out to be one of those times that my instincts proved to be spot on target. My pesto was no longer boring! The addition of the garlic and lemon really woke up the flavor of the greens and the red pepper flakes left a very tiny bit of heat at the finish. And the color was STUNNING. Bright green, with teeny flakes of cheese, garlic, and red pepper. The whole batch just looked so alive! Not a bad effort for a rescue mission. So now I have a bowl of brilliant “everything” pesto, just ready for some chicken or pork, or even some of the few fresh tomatoes I have left. Best of all, it’s completely Paleo…so I can eat it even after my challenge starts on Monday. Maybe I should thank my flaky freezing fridge? It’s time to start thinking about holiday gifts! Now, before you completely freak out, I REALIZE that fall has only now decided to start showing itself to most of us. The trees here in Southern Maryland are only showing the barest HINT of color. However, now is harvest time… and now is the perfect opportunity to capture that peak flavor in gifts for your loved ones. Jellies and jams are beautiful and tasty for gift giving. But let’s say you’re not the jelly or jam type. After all, jellies and jams take time and equipment. Cooking down the fruit, processing the canning jars, it takes a lot of time and effort! 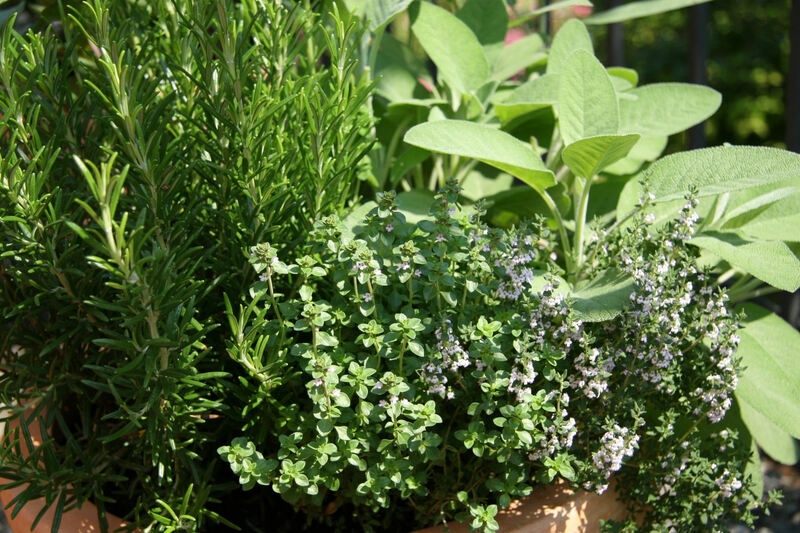 However, herb gifts are beautiful, delicious, and EASY to make. One of my favorite things to make and to use is herb salt. Think rosemary roasted potatoes. But rosemary isn’t always the easiest thing to work with, right? I mean it’s kind of woody, and sappy, and if you don’t mince it fine enough, it’s really hard to chew! BUT, think rosemary salt out of a shaker, to season those potatoes and the rosemary is already perfectly processed, and the oils have infused the salt to bring that flavor without the downside. Strip the leaves off of the stems of the rosemary and add them to your food processor. The amount is UP TO YOU. I like my salt quite “herby” so I usually end up with about 3 – 4 Tablespoons of chopped herbs per cup of salt. Pulse the processor to start chopping the herbs a bit. You want a very fine mince, not liquified herbs, so PULSE! Then add about a cup of sea salt and pulse again until the salt grains are reduced to the size of Kosher salt grains. Pour the herbed salt out into a measuring cup and then mix with an equal amount of Kosher salt. Pour into small jars and seal. The herbs will infuse the salt after 2 weeks, and the mixture keeps for months. 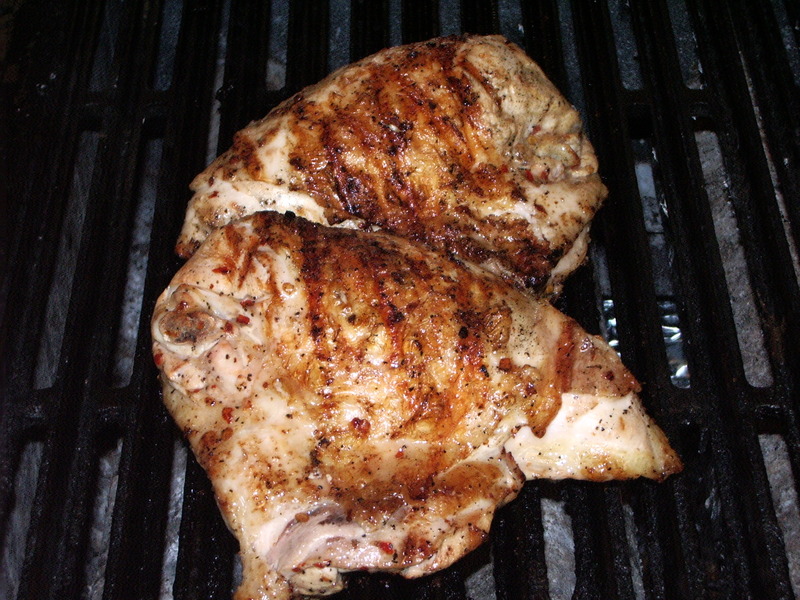 Delicious on potatoes, or as a rub for meat or chicken. You can use ANY herb, or even combinations of herbs. 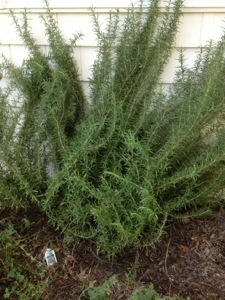 Here’s the ONLY thing to remember…rosemary is a fairly “dry” herb. I also like using sage, parsley, thyme, garlic and oregano, basil… for those herbs that have more moisture in their leaves, you will have to give the salt time to dry a bit before sealing in the jars. 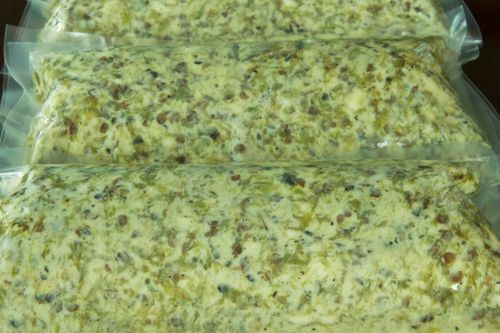 Once you have mixed the herb and sea salt mixture with the Kosher salt, lay the entire batch out on a sheet pan near an open window to dry out for a few days. THEN pack the salt into jars for gift giving. Another great (and easy!) idea is herb infused oil. This takes a little more time… and some planning, but it’s worth it. Besides, you aren’t going to be doing anything during the time… the sun or your dehydrator is! Pick your herbs at the peak of flavor. 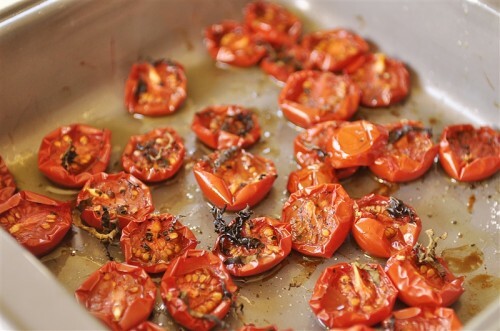 Then either dry them in a food dehydrator, or in the sun. Once dry, put the herbs into the jar you will use as your infusing vessel. You want enough herbs to fill at least 1/4 of the jar. Be sure to keep a few sprigs of dried herbs out to put into the bottles of your final product! Now, pour in the olive oil (you can use canola oil too, but I prefer olive) over the herbs and seal the jar. Let the oil sit for at least a month to infuse the flavors. Once infused, put a sprig of dried herb into the bottle you are going to use, and pour the infused oil through a strainer into a funnel and into the bottle. Seal and decorate with a ribbon. Rosemary works well here too, but so does basil, thyme, and oregano. Also, don’t be afraid to add maybe some red pepper, or small dried chiles, or peppercorns to your oil to give it that extra kick. Also remember, the more delicately flavored the herb, the lighter in flavor your oil has to be. If you don’t want to have to worry about drying your herbs before gift giving, then herb vinegar is your answer! There are a few rules in play: any vinegar for herbed vinegar must be at least 5% acidity, and you must use non-reactive (NON-METAL!) utensils, jars, lids, etc. You can add herbs, garlic, orange and lemon peels, chiles, whole spices, you are limited ONLY by your imagination! Wash the herbs and pat them dry, put them into the jar you are using as your infusing vehicle. Pour room temperature vinegar over your herbs and seal with a non-metal lid. Put the vinegar into a cool, dark place for 2-4 weeks. Check for flavor, and when the desired strength is reached, strain the vinegar and discard the herbs. Add a fresh sprig of herb to your decorative bottles, and pour the vinegar in. Seal and decorate. Can you imagine a gift basket with some rosemary salt, oil and vinegar? Or maybe mix it up and give a mixture of salt, oil, and vinegar with Italian, Greek, or Herbs de Provence? You are only limited by your imagination and the bounty of your herb garden. Start planning and preparing now, and guaranteed you’ll have incredibly flavorful gifts to give your favorite foodies this holiday season!